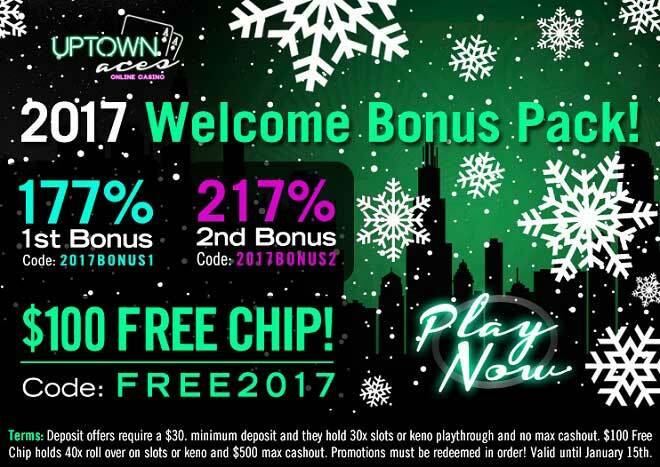 Uptown’s 2017 Welcome Bonus Pack + $100 Free Chip! What better way to celebrate the coming of a New Year than stuffing yourself with wins? And how about doing it in the outmost luxurious Uptown style with a duo of over the top bonuses plus Free Cash? Make your deposits of as little as $30 until January 15th and welcome 2017 with a 177% 1st Bonus, continue on towards a 217% Match and have a happy start of the New Year with a $100 Free Chip! Join us Uptown in welcoming 2017 and celebrate its arrival with a huge explosion of bonuses and guaranteed wins! $100 New Year's Free Chip! Deposit offers require a $30. minimum deposit and they hold 30x slots or keno playthrough and no max cashout. $100 Free Chip holds 40x roll over on slots or keno and $500 max cashout. Promotions must be redeemed in order! Valid until January 15th.